Place 75g organic quinoa and 75g organic kamut in a clear container, cover completely with room temperature water and soak for 3-4 hours. Drain well and rinse. Keep on counter and rinse every 8 hours or so. When you see the grains beginning to sprout, place them in the fridge until needed. This took about a day and a half for me. I never did see any sprouts on the red quinoa and the white sprouted very erratically. I forged on anyhow. The Kamut on the other hand sprouted very nicely! Place the high extraction flours in a tub and add the unbleached flour to it as well as the freshly ground flax. Cover and set aside. Rinse the sprouts, grind them in a food processor and place back into the fridge. (This step also can be done in the morning). Feed the levain 72 g of filtered water and 72 g of AP flour and let rise 4-5 hours in a warm spot. 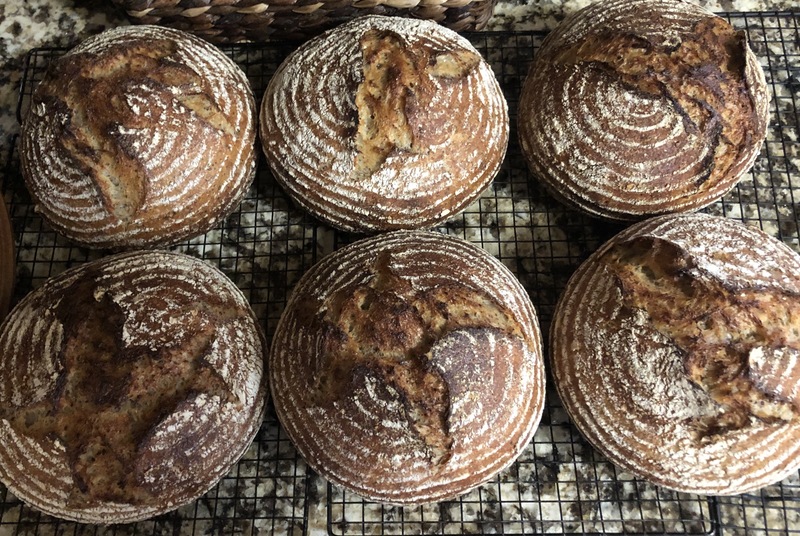 I found that the inclusion of high extraction flour the night before really sped up the levain. It was already on the way down when I used it. 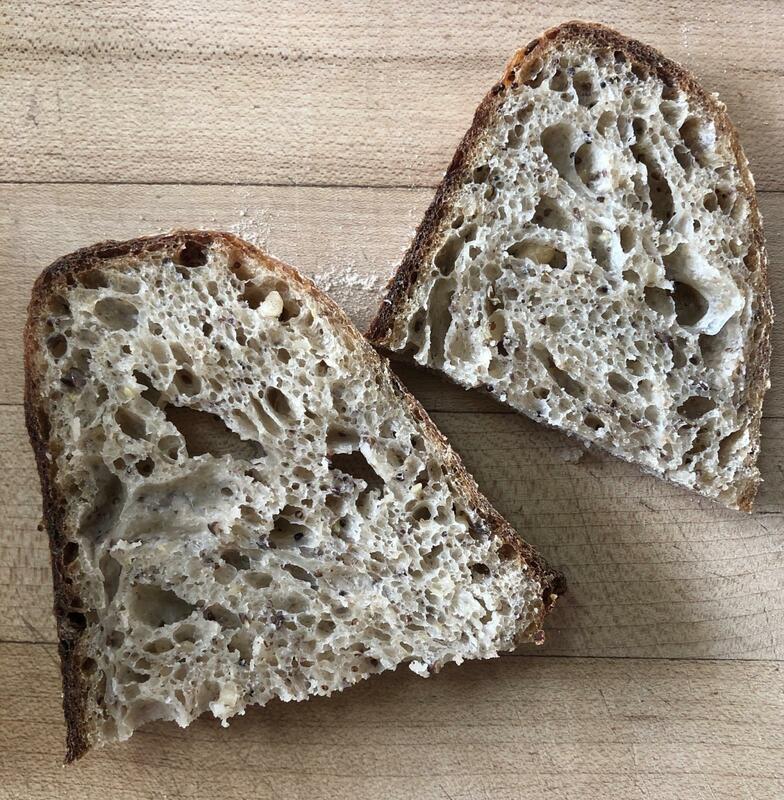 Two hours before the levain is ready, mix 860 g water with the flours on the lowest speed in the bowl of a stand mixer until all the flour has been hydrated. This takes a couple of minutes. Autolyse for a couple of hours. Once the levain is ready, add the salt, the yogurt, the sprouts and the levain to the bowl. Mix on one for a minute to integrate everything, mix on speed 2 for 5 minutes. Tip the dough out on a bare counter, sprinkle the top with flour and divide into portions of ~870 g. Round out the portions into rounds with a dough scraper and let rest 30 minutes on the counter. Sprinkle half rice/half AP flour, and then bran (I forgot the bran!) in the bannetons. Place the dough seam side down in the bannetons. Let rest for a few minutes on the counter and then put to bed in a cold (38F) fridge for 9-10 hours. 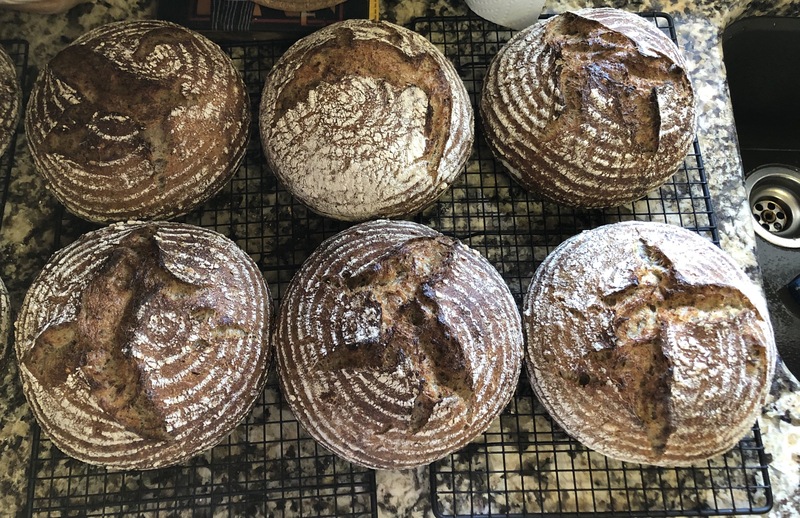 These used a bit more flour than my usual base of ~1100 grams so I got slightly bigger boules. I was a bit worried that they wouldn’t fit in my pots, but the loaves had plenty of room to spring nicely. I am very pleased with these. 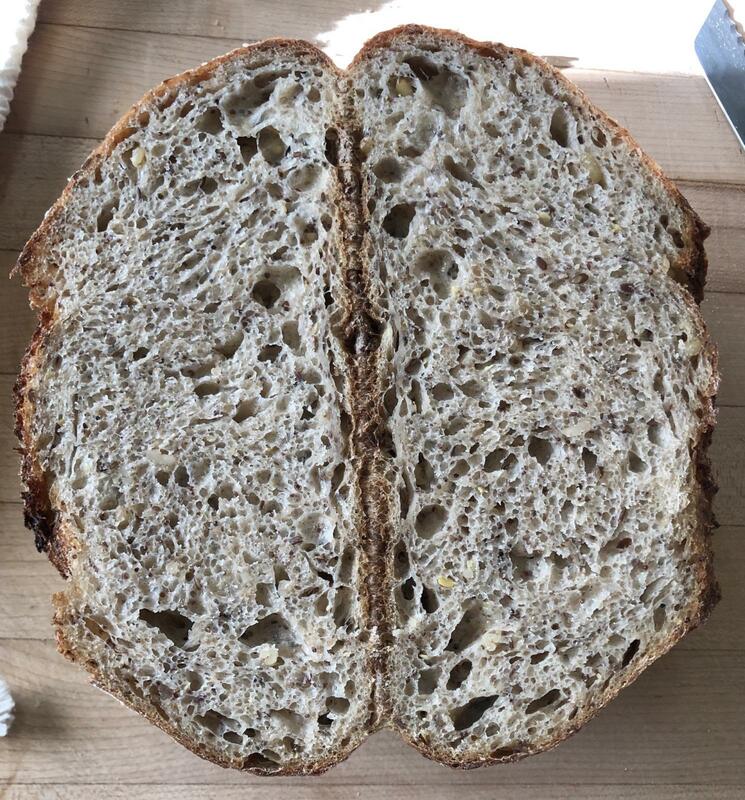 Hopefully the crumb is as nice as the outside. Sprouted quinoa AND sprouted kamut! What fortunate people your customers are! These loaves look nice and tall to me. If the crumb is half as good as the outside, I'd claim this a success. I had the same experience as you did when sprouting quinoa. For both black and white quinoa, the emerging radicle was only observed in a small proportion of them. Despite that, they did have that "sprouted" aroma after 1 day. Their taste was very distinguishable from that of the non-sprouted ones too. I've not sprouted red quinoa so I don't know if it sprouts well. and I really must give sprouting a go...it must taste amazing...! I had to look up what it was. I'll have to keep an eye out for it during my travels. Your methods are so amazing - but I don’t have a mill and I still get confused with high /low extraction flours, and sprouting. So if I can find berries then I can sprout them I guess? I have found some sprouts grains but would have to check. Love your recipes! For the various flours that I mill, you can buy whole grain flour of the same kind and just sift them through a fine metal kitchen sieve. I actually use a metal kitchen sieve to sift my flour... it takes the larger pieces of bran out. The flour that is left is called high extraction flour. As to sprouting, you need whole grains such as wheat berries or in this case, kamut berries (the individual grains are called berries). They might be a little more difficult to find but some health food stores might carry them or some bulk stores.